Do you want to know how to make use of the best Amazon and Kindle tools? Listen as Kindle marketing Jedi, Dave Chesson shares his special marketing powers to help authors navigate the best Amazon and Kindle tools. 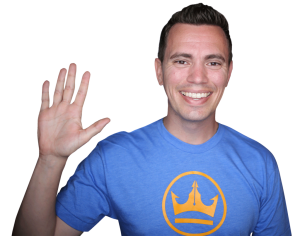 When he’s not lightsaber dueling with little Jedi or sipping tea with princesses, Dave Chesson is testing new book marketing tactics and helping authors improve their book sales on his website, Kindlepreneur. He’s worked with multiple New York Times bestselling authors like Ted Decker and L. Ron Hubbard’s marketing company as a consultant, as well as helping top writers like Pat Flynn and Jeff Goins. To help all writers learn the art of book marketing, he created Kindlepreneur as a free source for authors with the sole goal of giving you everything you need to take action and see results. Q: Dave, I don’t want to assume that everybody knows and understands exactly what Kindle is, so give us a quick overview of what it is and why it’s important for authors to use Kindle to help build their author platform. A: Years ago, Amazon shook the foundation of book sales when they created Kindle Direct Publishing, which is the ability for us authors to just go straight into the market and put a book out there. Before KDP, you would have to convince someone that it is worth selling your book and that someone would be a publishing editor. It was just a terrible process. People who had great books were not able to get it onto the market. When Amazon said, “Hey, just come to us. We’ll put it out there and give you a chance to get your book in front of readers and make sales,” that just changed everything. When we talk about Kindle, Kindle was Amazon’s push to be able to create ebooks where they could digitally sell it to their millions and millions of shoppers. Once they did that, right now the publishing world is trying to catch up. To contact Dave Chesson for more information about her services.